The auction of IPL season 4 may give us quite different teams and player combination for upcoming matches in 2011. As you know my dear readers this time auction format and rules will be totally changed. 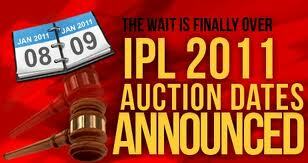 All team will be auctioned and it is possible that players of previous game may be auctioned in another IPL team. So can't say anything about IPL teams and player action, we can just wait for auction result and upcoming team fixtures. When I heard the price of player that auctioned in IPL season 1, it really make me so curious about to know players' auction and their bidding details, team info and many more. In first season indian players topped in bid, but according to recent form of international players it's doesn't seem that indian players will top this time in bidding. Kiron Pollard, David warner, Yusuf pathan, Dale Steyn, Sachin Tendulkar, MS Dhoni and lots of other players are in a queue for the category of highest bidding player. The auction for the cash-rich event IPL’s fourth edition will take place on 8 and 9 January 2011, where 350 best cricketers will go under the auctioneer’s hammer in Bangalore. A professional auctioneer from England, Richard Madley will conduct the auction. Sony Set Max will telecast live proceedings. Various IPL franchises have produced a short list of 350 cricketers out of 421 cricketers, who had expressed an interest to take part in the auction. The Board of Control for Cricket in India (BCCI) terminated the contracts of Rajasthan Royals and King’s XI Punjab. Now, Rajasthan Royals and King’s XI Punjab are being provided with relief by courts. So, at present, 10 franchisees would bid for the players. Five franchises have retained twelve players from previous tournament like Sachin Tendulkar, Mahendra Singh Dhoni, Kieron Pollard, Shane Warne and Shane Watson, Virender Sehwag, etc. in advance of the auction as per the IPL player regulations. The opening match of IPL 2011 will be held on 8th April 2011 in Chennai. Chairman of IPL, Chirayu Amin, said, “The DLF IPL auction is indeed a very exciting prospect! I am confident that IPL fans throughout India and across the world will be paying very close attention to which of the world's best cricketers will be wearing their teams colours for the next IPL season”. “Top Indian players such as Gautam Gambhir, Zaheer Khan, Ashish Nehra and Yuvraj Singh will be up for grabs for the 10 franchises,” said on Wednesday by the Indian cricket board.